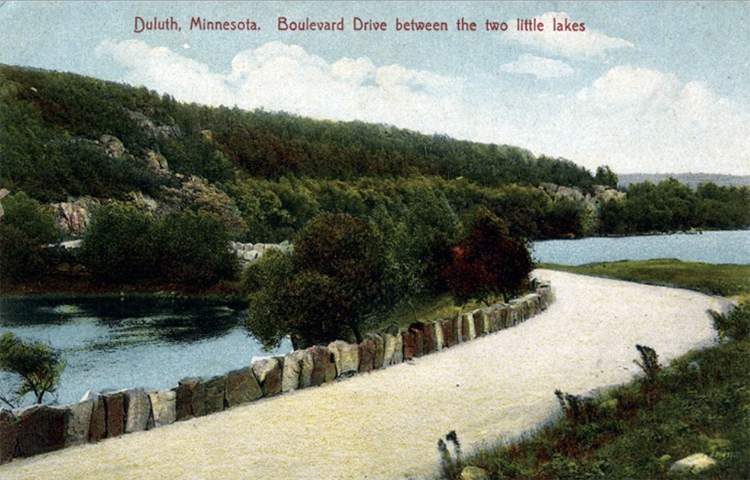 Buckingham Creek is not one of Duluth’s better-known waterways, but it is most recognizable as the creek flowing through Twin Ponds near Enger Tower, criss-crossed by the West End leg of the Superior Hiking Trail, and nearly disappearing into manmade culverts in the neighborhood between 11th and 12th Avenues West. The creek is named for surveyor F. A. Buckingham, who built a claim shanty where it crossed Superior Street in the earliest of Duluth’s pioneer days. It is now over thirty-eight years since I tramped across the old trail from Bishoff’s, carrying the first pack I ever carried. Oh, how heavy it was at the start. The party consisted of E. F. Ely, Tom Shantweed, John Irving, a man by the name of Banker, and myself. I was the smallest one. Once, when the packs were made up, behold, they all took their choice but me. After they had all got ready I was told: “There is your load.” Well, I looked at it but could say nothing. How was I to carry that load? For a greenhand it was enormous. But nothing was to be done but take it and say nothing. The first night and morning made my load lighter. Stayed over Sunday at the old cabin called the half-way house; that lightened my load still more. I remember the first day I saw him. There were at that time men whom the kids called cranks. They were eccentric. Well, Buckingham was one of the most eccentric. The first morning I laid eyes on him he was standing bareheaded, clad only in a woolen shirt and that was open in front, baring his chest to a northeaster that blew a gale registering the thermometer at 40 degrees below zero. Of course he had on moccasins, as that was the stylish footwear in those days. Merritt goes on to tell of how “old” Buckingham was a vociferous hater of Abraham Lincoln, which served to make him the victim of violent assaults by local youths. This is curious, because by many accounts, Buckingham left Duluth at the beginning of the Civil War, never to return. What would make a man hate Lincoln before the Civil War even began? Had Buckingham developed an antipathy due to Illinois politics? Or, despite Duluth’s heavy Republican leanings, was Buckingham simply a Democrat—even possibly a “Copperhead,” a radical who despised Lincoln for making war in the first place? A little digging provides some answers, and it is the fact that Merritt refers to Buckingham’s decrepitude more than once in his account that provides the clue. While Merritt was a boy of ten or twelve when meeting Buckingham for the first time in 1854, it is doubtful he would view a man in his early 20s as “old,” even if he had a big beard and liked to strut about half-naked in sub-zero temperatures. Buckingham did indeed go off to join the Grand Army of the Republic as the Civil War began, volunteering in the Second Minnesota Volunteer Infantry, where he began as a hospital steward. In September of 1863, he participated in the Battle of Chickamauga, which ended up being one of the worst Union losses in the war. We remember the Battle of Gettysburg as the fight with the highest number of casualties; Chickamauga comes in second. Buckingham was among the nearly 5,000 who were taken prisoner by the Confederates during this defeat. While Buckingham might have resented Lincoln for the leadership blunders that happened at Chickamauga, it is far more likely that his hatred was nurtured during his winter as a prisoner of war, when the Union leadership delayed prisoner exchanges for strategic benefit. The fact that he served his time at Libby and Danville was a unique torture. Accounts of Libby and Danville that winter paint a picture of incomprehensible horror, plagued with vermin of all kinds, enforced starvation, and extreme cold. Emaciated prisoners stumbled about night and day to keep from freezing to death. Smallpox swept through Danville that January, killing hundreds and causing nearby townsfolk to complain about the persistent stench. Desperate prisoners attempted to dig tunnels to escape, and as punishment, all of them were confined to upper floors, worsening the overcrowding. Prisoners who showed themselves at windows could expect to be shot. Buckingham was released in May of 1864, and according to the 1865 census, returned to Duluth. After such horrific trauma, Merritt’s tale of Buckingham’s defiant declaration of gladness upon hearing of Lincoln’s assassination and subsequent violence perpetrated against him seems more logical. It also makes sense that a man recovering from severe privation might appear old and strange to Merritt, despite the fact that he was only in his mid-thirties at the time. Buckingham appears to have traveled frequently between Rockford, Illinois, and Duluth during those post-war years. He married and had a son with a woman named Frances Helen in Rockford, and owned a tobacco shop there in 1867. But the 1870 census puts him back in Duluth with his new family, again a surveyor and owning $4,000 in real estate. When his son died at age 7 in 1876, they were residents of Rockford. He and Frances bore no other children. When she died in 1907, she had been an invalid for 18 years. According to Rockford newspapers, Buckingham was a tireless participant in G.A.R. veterans’ activities, never missing a Decoration Day until his death in 1911.